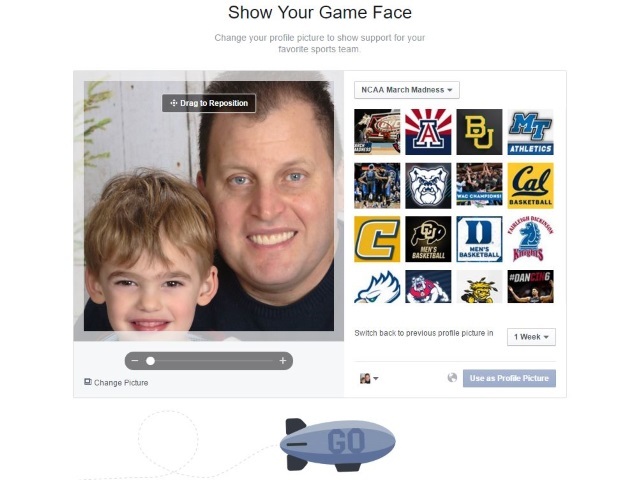 Facebook is embracing March Madness, with temporary custom frames for profile pictures for teams in the 2016 NCAA Men’s Division I Basketball Championship tournament highlighting its efforts. Facebook Live videos will also take to the court, as the social network said in an email to SocialTimes that teams, including the University of Oregon, University of Virginia and Duke University, will tap into the live-video-streaming feature, as will college basketball legends such as Grant Hill. Several examples are embedded below. Show your team spirit with customized group chats: College basketball season is a time for friends and families to come together and for rivals who went to schools with a slightly different shade of blue to taunt. Within Messenger, you can set a “team” name for your group chat, change the chat’s colors to those of your favorite team, change the Like emoji from a “thumbs up” to a basketball (or whatever else might be appropriate!) and give your buddies nicknames like “slam dunk king” or their favorite player’s jersey number. Anyone in the conversation can customize the group, meaning that there’s lots of potential for back and forth. Get organized with Payments: Don’t waste your time chasing your friends down for their shares of the tab after you go out to watch the games—or for their shares of snacks and drinks if you’re staying in. Ask everyone to settle up through Messenger by sending the person who covered the tab his/her share. Here’s where you can learn more. Get excited with basketball stickers: Do some trash-talking or celebrate the slam dunks with basketball-related fun using the Sports Talk sticker pack. Only two universities involved in this year’s tournament have seven-digit like totals: University of North Carolina (1.1 million) and University of Kentucky (1 million). Readers: Which teams do you have finishing atop your brackets?